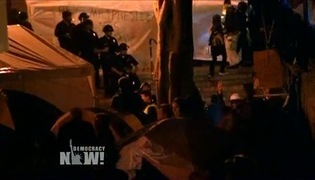 NYC Withdraws Cleaning Evacuation Order in Face of Defiant Occupy Wall Street Protesters | Democracy Now! New York city council member, District 45. JUAN GONZALEZ: The situation at the Occupy Wall Street encampment is rapidly developing this morning. Thousands answered a call for support and streamed into New York’s Financial District overnight ahead of a, quote, “cleaning” that many feared would actually lead to a [clearing] of Zuccotti Park, where protesters have stayed since September 17th. Well, shortly before 7:00 a.m. this morning, they got word that the feared evacuation had been canceled. UNIDENTIFIED: It is 6:30 a.m. in Liberty Plaza right here. The mood is jubilant. Brookfield Properties announced they are postponing the cleaning. PROTESTERS: The people, united, will never be defeated! The people, united, will never be defeated! The people, united, will never be defeated! AMY GOODMAN: Deputy Mayor Cas Holloway issued the following statement about the canceled park cleaning, which reads in part, quote, “Late last night, we received notice from the owners of Zuccotti Park—Brookfield Properties—that they are postponing their scheduled cleaning of the park, and for the time being withdrawing their request from earlier in the week for police assistance during their cleaning operation,” unquote. For more, we go directly to Zuccotti Park, site of the Occupy Wall Street encampment, where we have a number of Democracy Now! producers on the scene. We’re starting with Ryan Devereaux. We’re using Democracy Now! live stream to broadcast from the heart of the park. Ryan, tell us what has happened. As we broadcast right now, word came down about an hour ago that, well, the 99 percenters had won this round. Tell us what happened. RYAN DEVEREAUX: That’s correct, Amy. As the sun began to rise over Liberty Plaza this morning, news started to break, started to filter out, that the cleaning operation, that some had viewed as a pretext for an eviction, was going to be delayed. Cheers broke out. People blared horns. The mood was incredibly jubilant and celebratory. It was a tense night here in the park. They were cleaning all day yesterday and all through the night to make sure that this place was spotless when city inspectors came to check it out. And I must say, it is very, very clean. The rain also helped. But the mood here is one of sheer joy. A number of protesters have marched down Broadway in the direction of Wall Street, unclear where they’re headed. But it’s quite the scene here. JUAN GONZALEZ: And Ryan, what’s been the relationship between the protesters and the police? Obviously, it was very tense and confrontational early on in the first weeks of the protest. Has there been any change in that? RYAN DEVEREAUX: Well, it’s been a really interesting dynamic between the protesters and the police, that’s for sure. Obviously, you know, some of the things that the police have done in recent weeks have caught a lot of headlines, beginning in late September when 80 people were arrested on a march near Union Square. Four young women were corralled and pepper-sprayed by Deputy Inspector Anthony Bologna. That was caught on video, that—those videos went viral, as did another video of Bologna pepper-spraying another protester on the sidewalk. Following that incident, the protest gained more attention. More people began to follow what was going on, and more people turned out in Liberty Plaza to support the cause. Exactly one week later, the NYPD made headlines once again when they arrested over 700—over 730 protesters attempting to cross the Brooklyn Bridge. The arrests came under fire from a lot of critics who said that the police led the protesters onto the bridge, that they escorted them onto the bridge, and that they gave them the false impression that they would be able to cross the bridge. And then, when they made it about halfway across, about a third of the way across, they were stopped, kettled, as it’s called—caught in orange nets—and arrested en masse. And once again, the police, in their actions, gained this movement a ton of attention, a ton of press and a ton of sympathy in the United States and around the world. And following that incident, we began to see occupation movements springing up around the country. There are reportedly over a thousand occupations taking place in cities around the United States, and similar crackdowns, I should say, in a number of [inaudible], in Boston and an attempt in Atlanta. It’s really something else. Something about this movement has resonated with people across the country. AMY GOODMAN: Ryan, I was with you last night until around 11:00, as we walked through the park. And what was clearly in evidence were many, many mops, brooms, soap buckets filled with water. People were cleaning that park up. And I think it’s interesting, the words of the New York City deputy mayor, Cas Holloway, who said, “Late last night, we received notice from the owners of Zuccotti Park.” I think what they did is they received notice from the occupiers of Zuccotti Park that they would not be moved. We watched as the General Assembly did that chant, when you have a human mic and they keep repeating. The forces were so strong, the determination, but also keeping the park clean, that was very clear, as well. People were cleaning up throughout. How about, Ryan, the issue of union leaders. For example, Teamsters. Have they come out to stand with the protesters today? RYAN DEVEREAUX: Yes, absolutely, Amy. At about 6:00 in the morning, a march of union members arrived to Liberty Square, and the reception was one of pure joy, chanting, cheering. It really bolstered the numbers here. And you’re right that the resolve among the protesters here has been quite remarkable. They spent the better part of all day yesterday cleaning this plaza, making sure that it was as clean as possible when the inspectors would arrive, giving the city absolutely no excuse to say that this was a unsanitary place. The General Assembly here allocated $3,000 from their treasury to buy cleaning supplies. People were armed with mops and buckets and did everything they possibly could to make this as clean as possible, so that if the City of New York did attempt to push them out, it would be clear that this was about something more than cleaning this plaza. AMY GOODMAN: Ryan, you and Democracy Now! 's Hany Massoud, around midnight, talked to a number of the protesters last night who were helping with the cleanup effort. Let's watch and listen. LUKE RICHARDSON: My name’s Luke Richardson. I’m 25. If you look to my left over here, you’ll see a lot of people are pushing brooms, mopping, cleaning, scrubbing. And we’re doing this in preparation for basically the Brookfield’s cleaning crew to come through tomorrow. They’ve asked us to leave, section by section, and allow them to do what they’re saying is a routine cleaning of this park. And so, we’re preparing for them. We don’t want to give them any—we don’t want to give them any reason to see fault. We have been cleaning since day one. We have a sanitation committee. But we’re doing a big extra special cleaning today. PONCHO GUTHRIE: Poncho Guthrie. The park is cleaner than a lot of areas around here. Now, I’m not from the area, but a lot of people I know who have lived in the area say it’s cleaner now than it was before the occupation came in. There aren’t any rats in there. The place is very sanitary. Garbage is picked up three times a day. We take care of the recycling. It’s very sanitary conditions. The only things that are lacking are things like showers and restrooms, which could be provided with a city permit. But unfortunately, we don’t have a city permit. So, any sanitary issues are kind of on Mr. Bloomberg’s plate. LUKE RICHARDSON: So we do get a sense that the cleaning is a pretext for a—as an excuse, basically, to try and remove us from the park. We’ve seen this happen in Spain during the M15 movement. We’ve seen it happen in New York City more recently during the Bloombergville occupation. So there’s a lot of history, even dating back to the early days of like the late 1800s, early 1900s, of people getting removed on grounds of sanitation, using the same, exact pretext. PROTESTERS: Occupy Wall Street! All day, all week! Occupy Wall Street! All day, all week! Occupy Wall Street! All day, all week! AMY GOODMAN: Some of the sounds and the people who were at Occupy Wall Street last night at midnight. Again, the latest news we have is that, as of 7:00 this morning, the time that was designated by the city for a cleaning up of the park, which many took as a clearing out of the park—we now turn to Jumaane Williams, New York City council member for District 45, first-generation Brooklynite of West Indian parentage. He has spent much of his career fighting for affordable housing. Juan? JUAN GONZALEZ: Yes, well, Councilman Williams, I wanted to ask you about the reaction of other members of the council who have been protesting this attempt by the city to move in and clean the park. COUNCIL MEMBER JUMAANE WILLIAMS: I just lost him. COUNCIL MEMBER JUMAANE WILLIAMS: OK, I think I heard the question. I lost part of it. But the reaction has been very good from the majority of my council members, and not all the usual suspects. Republican Dan Halloran has been down here previously, as well. I think everyone kind of understands that this is a great movement going on, and more importantly, it’s something that should be supported, just like we supported all the other movements that were going on around the world. And a lot of them had guns attached to it, and we supported them. These are—no, there’s no guns here. It’s just peaceful, peaceful protests, peaceful people here trying to spread an ideal. And there’s no reason to not support them like we supported everyone around the world. COUNCIL MEMBER JUMAANE WILLIAMS: Hello? JUAN GONZALEZ: Councilman, the city has been claiming that it was Brookfield Properties, the owners who built the park, who are—who asked for the cleaning. But I’ve been hearing from sources in the Health Department, as recently as the middle of last week, that they were being asked to come up with a rationale for the city to move in on the protesters. So it sounds like it was this claim—it sounds like this claim that—this claim that the city is saying that it was the owners of the park who asked is really a subterfuge for what is actually going on. We’ve apparently lost Councilman Williams, but do we have Michael Ratner on? AMY GOODMAN: This is Jumaane Williams. COUNCIL MEMBER JUMAANE WILLIAMS: —but with rules and regulations, says to me that what they want to do is squash the movement. I was excited when I saw the Mayor come here. I thought he was coming to engage the protesters or engage the occupiers and talk about their anger. But it seemed that he was just part of setting up the ruse. I guess today he didn’t want to be known in history as the person who squashed the movement. But, you know, all of the people who tried to set up the rules and regulations of how to protest might have been the same people who tried to stop the civil rights protesters, who tried to stop the women’s suffragist protesters, the people who put their hoses on and say, “You can’t march here, and you can’t do this.” You can’t give rules and regulations to a voice like this when people are suffering. AMY GOODMAN: City Council Member Jumaane Williams, it’s unusual what a group of city council members did, including you, yesterday, holding a news conference, telling the Mayor that he should not be using the police to guard the private cleaners to come in and clear the park, talking about other parks that are not cleaned, why suddenly is there an obsession with concern for the cleanliness of this park, which, by the way, the protesters have been cleaning around the clock since last night. Talk about that news conference and how the Mayor is dealing with you and other city council members who were defiant yesterday. COUNCIL MEMBER JUMAANE WILLIAMS: OK, should I keep talking? AMY GOODMAN: —as best we can. We’re going to just go to the audio of you, instead of the audio and video, so that we can have better sound. Jumaane Williams, explain what you were just saying. COUNCIL MEMBER JUMAANE WILLIAMS: They said to turn off the video. AMY GOODMAN: We can hear you well now, City Council Member Williams. Go ahead. Just explain what happened yesterday. COUNCIL MEMBER JUMAANE WILLIAMS: Yeah, all of a sudden, Zuccotti Park became the most important thing in New York City and the most important thing to clean. And I have a bunch of places in not just parks, but all over my district, that could use some cleaning, and particularly some other places in New York City. But my question to the Mayor is, where was he when we were talking about ways to save money for programs so people wouldn’t be getting shot in my district? Where is he now when we’re asking for his support on the millionaires’ tax? I can’t believe that this is the most important thing going on in New York City, that you would expend so much resources to make sure that this park gets cleaned up. It doesn’t make any sense. And I don’t think anyone is tricked by his guise of saying that it’s really that important to get Zuccotti Park cleaned up. And we, as council members and elected officials, saw through that, and we stepped up. And I’m happy that, for now, he seems to be on the right side of history, and we should celebrate this battle. But the war still rages on, and we have to see what’s going to happen tomorrow. I’m hoping that he at least pretends to care about the 99 percent of us, and not just the one percent, like himself and his friends. And I’m hoping that he does that, you know, come back down. Everybody who’s sat down with the occupiers, from the council member of this district, from the community board of this district, who had concerns and sat down and negotiated, and the occupiers have worked out their concerns. There’s no reason why Brookfield, no reason why the administration, no reason why the Mayor or the commissioner can’t do the same thing. But it’s the arrogance of these folk, that we’ve seen time and time again, that they can just come and do whatever they want, even though people are suffering. So, instead of coming down and to talk about the suffering that’s going on, the poverty that people are living with, the fact that one of my precincts has the most gun violence throughout the city, the fact that people are losing their homes, what they want to come talk about, with police presence, is cleaning up Zuccotti Park. AMY GOODMAN: City Council Member Jumaane Williams, before you go, you know, we—our global audience got to meet you on the day after Labor Day, because of your arrest the day before, if in fact you were actually arrested at the West Indian Day Parade. Could you explain what happened there? Again, Jumaane Williams is a New York city council member from Brooklyn, and the West Indian Day Parade on Labor Day is the largest such gathering in the United States of the Caribbean community. What happened to you, City Council Member Williams? COUNCIL MEMBER JUMAANE WILLIAMS: Well, myself and a good friend of mine, Kirsten John Foy, who is a aide to a public advocate, which is a citywide official here, were finishing the parade and trying to get back to a function for elected officials and for dignitaries and guests and people of the like. And the police are saying there was a frozen zone. But that’s really publicity. There was no frozen zone. There was no sensitive area. What it was is a barricade to try to prevent the parade-goers from going back. And we were given permission, more than one time, to go there. But we ran—we got into some police officers who didn’t care I was a council member, didn’t care he was an aide. We were, in fact, arrested. We were detained for some time and then let go. And this is all part of the same fight. I think there’s a culture of suppression. There’s a culture of inequality. And that’s all part of it. AMY GOODMAN: City Council Member Jumaane Williams, I want to thank you for being with us, New York city council member for District 45 in Brooklyn. He is a first-generation Brooklynite of West Indian parentage, has spent much of his time and his career fighting for affordable housing. We’re going to go to a break, and we’ll come back, and we’ll talk about what is this park, this privately owned park that’s open to the public, Zuccotti Park. We’ll also be speaking with human rights attorney Michael Ratner, the president of the Center for Constitutional Rights. He’s on the ground in Zuccotti Park. We’ll find out about what was a break-off march today that was happening just as we got word that the Mayor would not be using the police to move in with cleaners to clean out the park, or what the protesters said was clear out the park. We’ll find out what the latest developments are, as we stay on Zuccotti Park. But first, a break.